Perfect for bulbs, annual bedding, smaller shrubs, houseplants indoors, and many other ideas! These wonderful metallic looking planters will add an exquisite decorative look to your garden. Manufactured from frost and UV resistant plastic these will allow your plants to thrive. Each pot is 19cm square, and 17cm tall, with a volume of 3.8 litres. Supplied as 4 square plastic metallic finish planters in a mix of 3 different colours including gold, silver and copper. Measurements: 19cm x 19cm x 22cm. 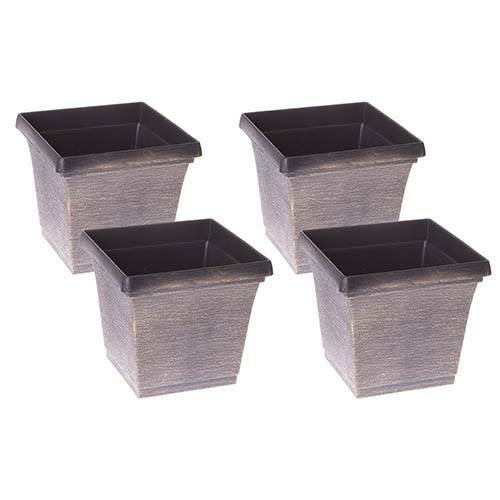 Our set of 4 Metallic Square Planters are perfect for bulbs, annual bedding, smaller shrubs, houseplants indoors, and many other ideas. They will add an exquisite, classical decorative look to your home or garden, without the cost of real metal pots. Manufactured from hard-wearing frost and UV resistant plastic with raised drainage holes and water reservoirs to allow your plants to thrive, they are very durable and are perfect for using on your patio. Hand-painted using a brand-new process developed last year, their metallic paint creates an eye-catching and stunning effect that will really add visual value to your beautiful plants! You will receive a mix of 3 colours including copper, gold and silver coloured hand-painted pots, every one different and unique. Great garden planters for smaller projects. Supplied as 4 square plastic metallic finish planters in a mix of 3 different colours including gold, silver and copper.